Avandia lawsuit settlements have been reached on heart attack, stroke, congestive heart failure (CHF) and heart-related death claims. If you or a loved one has suffered Avandia heart problems, you may be entitled to an Avandia settlement. Call 800-845-6913 or use the contact form on this page for a free, no-obligation consultation. We are accepting Avandia cases in all 50 states. Let us help you recover the Avandia side effects compensation you deserve. GlaxoSmithKline has agreed to Avandia lawsuit settlements totaling about $460 million to resolve Avandia heart attack, stroke and congestive heart failure (CHF) claims for personal injury and heart-related wrongful death damages. Avandia cases against GSK claim that the manufacturer of the Type 2 diabetes drug hid Avandia heart side effects and cardiovascular risks from the FDA, doctors and the public. In May 2010, Glaxo agreed to pay about $60 million in the first group of Avandia settlements. The cases were settled shortly before the first state court Avandia lawsuit trial was to begin in Philadelphia. In May 2007, an Avandia safety study published in the New England Journal of Medicine found that Avandia side effects include a 43% increase in heart attack risk and a 64% increase in the risk of death from heart disease. In response, the FDA issued an Avandia Drug Safety Alert and required a "Black Box Warning" be added to Avandia's label and prescribing information that was revised twice by the FDA in the following six months. The Senate Finance Committee launched an investigation into Avandia cardiovascular risk and the conduct of Avandia drug maker, GlaxoSmithKline (GSK). The Senate Finance Committee report on Avandia was released to the public on February 20, 2010. Senate investigators found that GSK was aware of potential Avandia heart risks for several years before the May 2007 study was published and that it should have warned patients, doctors and the FDA of its Avandia safety concerns. "Instead," the investigators found, "GSK executives attempted to intimidate independent physicians, focused on strategies to minimize or misrepresent findings that Avandia may increase cardiovascular risk, and sought ways to downplay findings that a competing drug might reduce cardiovascular risk." Glaxo used tactics to manipulate science and research in order to sell more Avandia at the expense of public safety. On September 23, 2010, the FDA severely restricted the use of the diabetes drug Avandia (rosiglitazone) and combination diabetes pills Avandamet (rosiglitazone + metformin) Avandaryl (rosiglitazone + glimepiride). The move followed a July FDA Avandia drug safety advisory panel recommendation to revise the Avanida warning label and add tough new restrictions on use of the diabetes treatment. 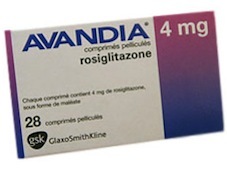 In Europe, the EMA ordered an Avandia recall and all diabetes drugs containing rosiglitazone were taken off the european market. The first Avandia lawsuit trial is set begin later this year in federal court in Philadelphia. There is no Avandia class action. Lawsuits for Avandia side effects compensation are filed as individual cases by Avandia lawyers representing diabetes patients and their families. The manufacturer of Avandia, GlaxoSmithKline, has agreed to pay millions of dollars to settle Avandia lawsuit claims.